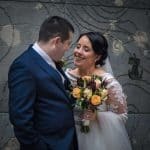 This Clontarf Castle wedding video elopement was such a joy to create. Pei and Xin are an amazing couple who have a beautiful daughter together. They were searching for a wedding videographer in Dublin and found my details. It has always been Pei’s dream to get married in a Castle and her dream finally came true! They flew in from Canada to celebrate with 50 close friends and family in the lovely Clontarf Castle hotel. Hope you enjoy this snippet from their Clontarf Castle Hotel Wedding Video!